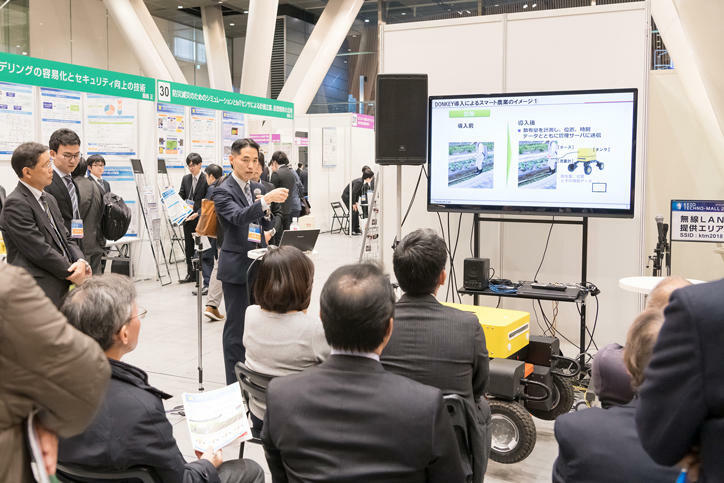 The Keio Leading-edge Laboratory of Science and Technology (KLL) held the 19th Keio Science and Technology Exhibition "KEIO TECHNO-MALL 2018" at Tokyo International Forum on Friday, December 14, 2018. KEIO TECHNO-MALL is an event to showcase the research results of Keio University’s Faculty and Graduate School of Science and Technology, and a platform to facilitate fruitful encounters between government, industry, and academia. For the 19th event, "Beyond imagination－March towards the future" was chosen as the theme. 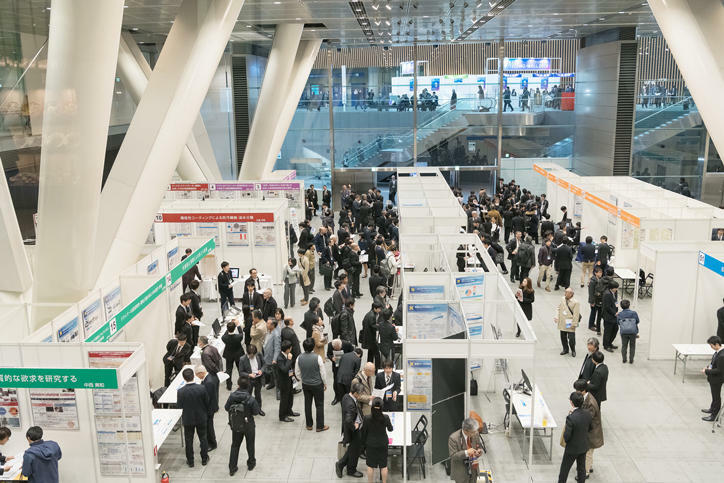 In addition to about 100 booth and panel exhibits focusing on demonstrations, numerous events to promote industry-academia collaboration were held. Each event had lively discussions and the 1,937 visitors that attended had similarly enthusiastic interactions involving exchanges of information and opinions throughout the venue. 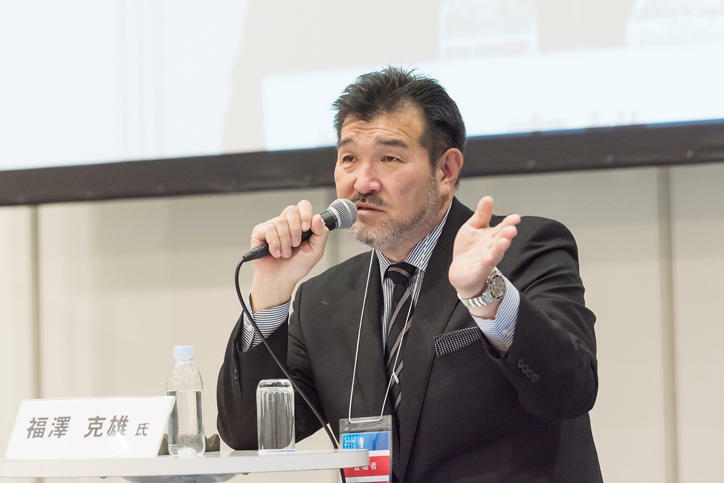 At the event stage inside the venue, a special interview titled "Expectations for Keio-originated technology: Toward dreams" with Mr. Katsuo Fukuzawa, a television drama and film director and the great-great-grandchild of Yukichi Fukuzawa, was held. He discussed the much-talked-about TV drama "Downtown rocket" which he is directing, his feelings with regards to the challenges of developing new technologies, which is a key theme of the show, and his expectations of science and technology education and research at Keio, while adding stories of his own upbringing. 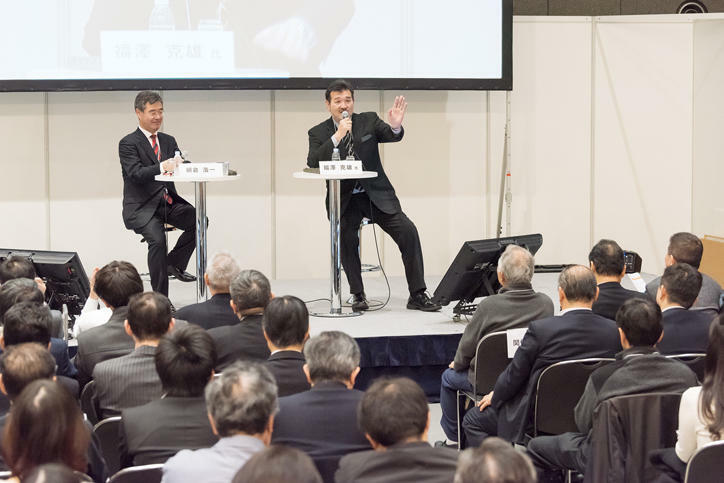 Special interview "Expectations for Keio-originated technology: Toward dreams"
Two roundtable sessions were also held in the event hall. "Using AI that goes beyond play: Can AI really achieve results?" 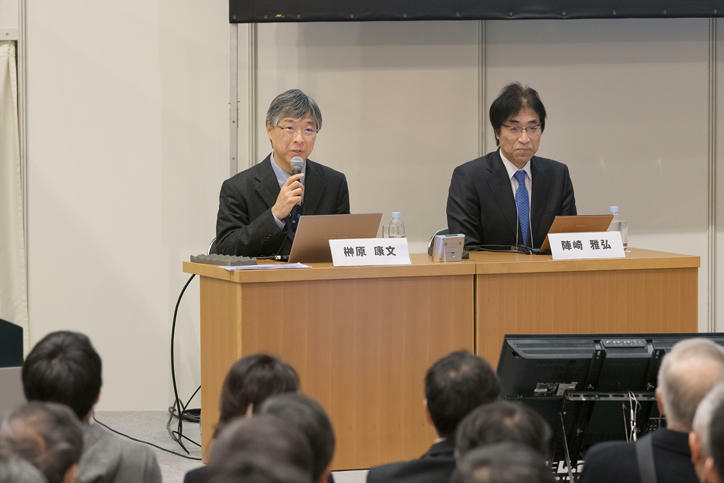 was the theme of Roundtable Session I, and heated discussions that illustrated the immense possibilities of artificial intelligence were held by a panel that included Mr. Shigeki Ishikawa, Mr. Masaya Mori, and Mr. Ryo Shimizu, who are all active in companies carrying out research and development in the area of artificial intelligence or providing AI services. They were joined in these discussions by researchers from the School of Medicine and Faculty of Science and Technology. Roundtable Session I "Using AI that goes beyond play: Can AI really achieve results?" Roundtable Session II "Future technologies are just around the corner!" The theme of Roundtable Session II was "Future technologies are just around the corner!" At this session, Mr. Hiromichi Shinohara, active in the information and communication industry where dramatic innovations are unfolding, and Mr. Tomomi Nakamura, working in the automotive industry, were invited to discuss frameworks and potential methods for universities to strengthen collaboration with industry through their technologies and ideas while promoting cooperation and addressing the necessity to enhance Japanese competitiveness through open innovation. In addition, there were exhibitions that gave a sense of the future course of research, which included a group exhibition with "substances" and "life" as keywords presented by 15 researchers working in chemistry and life sciences fields, and exhibitions at the Medical-Engineering Collaboration Zone that highlighted the collaborative research being carried out by the researchers at the School of Medicine and Faculty of Science and Technology. 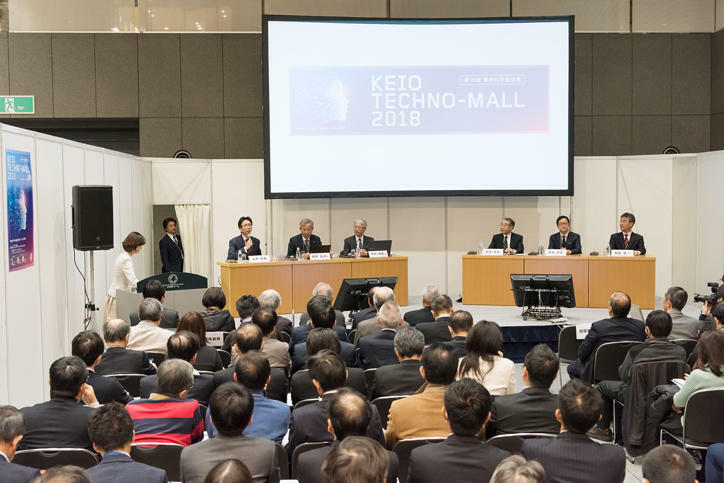 KEIO TECHNO-MALL 2019 is planned to be held at the same venue, the Tokyo International Forum, on Friday, December 13, 2019. While valuing the encounters we have at the KEIO TECHNO-MALL, we will continue to fulfill KLL’s mission of promoting industry-government-academia collaboration.